Carl Schimmel comes across as an almost wayward iconoclast on the recent CD RoADSHoW (New Focus 167). 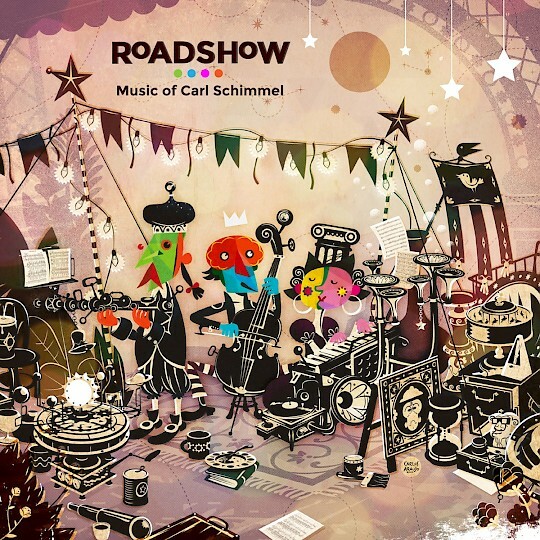 The music has an element of circus whimsy meets modern chamber seriousness, especially on the flute-cello-clarinet-piano work "RoADSHoW for OTTo" (2010/2012) and "RoADSHoW FoR THoRA" (2015), for clarinet, violin, cello and piano. The song cycle "FoUR NoCTURNES FRoM 'THE OBLIVIoN HA HA'" ((2010) has a rather soberly expressive contemporary post-serial demeanor, punctuated by the burnished vocal quality of mezzo-soprano Lucy Shelton and the carefully drawn parts for the quintet of instrumentalists known as the DaCapo Players. "String Quartet #2 'Six Faces'" (2010) begins with a dense thicket of strings, which metamorphoses into quietly expressive worlds and contrasting moods inspired in its six movements by six varied paintings. The music in the composer's vision is like a six-sided cube, a single woman in six different faces or identities. It is a very dramatic, modernistically complex work that shows the hand of a master chamber craftsman at his finest. "THE PISMERIST'S CONGERIES" (2005) takes flute-violin-cello-piano form with nine movements, each musically describing an object in the collection of a pismerist (a collector of small or insignificant things). The character pieces/sketches have a playful quality and bring the program to a satisfying close. Schimmel gives us equal doses of whimsy, mathematical-musical rigor and expressive power in this collection of works. He goes his own way to a happy result. Anyone with a modern-oriented set of ears will do well to check this music out. It does not matter how far along I go in life. It seems like every so often there is more excellent Villa-Lobos to discover. Naxos has been doing a good deal lately to underscore how his entire oeuvre has much to recommend it. 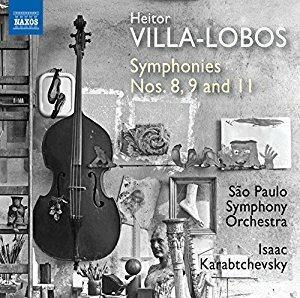 That is the case once again in the latest release from the Villa-Lobos symphony cycle, the Symphonies 8, 9 and 11 (Naxos 8.573777) as played with great capability and verve by the Sao Paulo Symphony Orchestra under Isaac Karabtchevsky. They are a product of Villa-Lobos' later period, having been written between 1950 and 1955. They have that distinctive meld of rhapsodic modernism and Villa-Lobos' own take on Brazilian influences. In the case of the latter there is less of a direct line to a national strain and more of a haunting. Everything he did had some relationship to his rich Brazilian heritage but then in this case there is less a conscious effort of incorporation so much as a natural predilection that gets harnessed to a symphonic classical-modern identity. The years in the United States had no doubt an influence on the widening of his musical view, but in any event it reflected a natural growth and a continued opening of his expressive needs. By this time Villa-Lobos had fully mastered the modern orchestra as a personal extension of his musical personality, so much so that you could recognize him by hearing only a few bars of a work. These three symphonies give us a generous helping of the composer at this juncture. All of them are substantial and very worth hearing. Perhaps the 11th has the most gravity, but then the 8th and 9th have the most buoyancy. None of these symphonies are inconsequential. Far from it. They are manna for the Villa-Lobos enthusiast and a deep plunge into the later world of his approach even if you are not fully conversant with his total span of expression. Karabtchevsky and the Sao Paulo Orchestra breathe a good deal of plein air into the scores. An excellent addition to anyone's Villa-Lobos holdings! Very recommended. When I was listening the other day to Louis Couperin's Suites et Pavane (Alpha Classics 333) as recorded by harpsichordist Skip Sempe my partner perked up her ears and commented, "That's nice. Who is it? Sounds like Bach!" And I tried to explain it all succinctly. "Well, maybe the Bach of the English and French Suites. Otherwise, not so much. 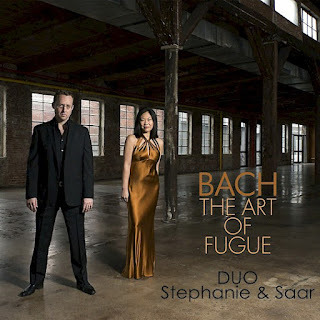 The fugal Bach was about the architecture and perfection of God's creation; Louis and Francois Couperin and the French Baroque were more about the human in the world with all her or his feelings and frailties. They were closer to a kind of Romanticism; Bach was raising great edifices of form." And she understood. Neither schools are in the end exactly comparable. There is a sweetness to Couperin and Rameau where Bach was a master builder who incorporates feelings but more internal, more embedded in each structural whole. So it seems to me. 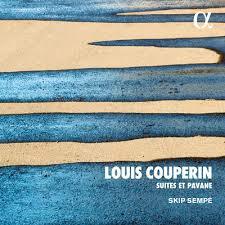 This recording of Couperin by Skip Sempe is close to ideal. 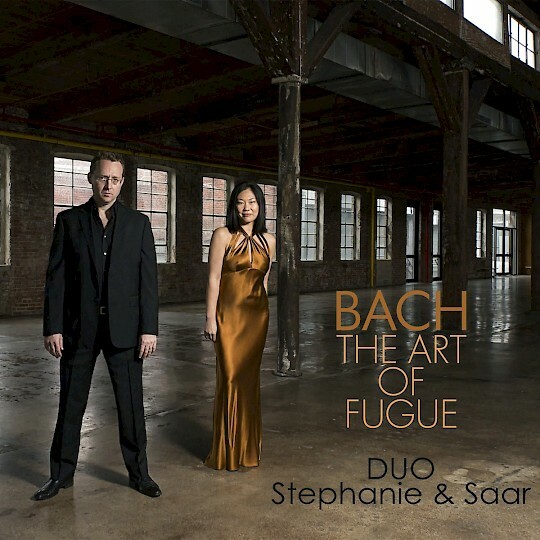 The six "Suite de Pieces" and the "Pavane" are played with a poetic rubato that is just enough to heighten expression without going to distorted extremes. That sweet quality is brought to the forefront and gives us as cogent an argument for Louis Couperin's brilliance as any I've heard. Each of the Suites and the Pavane relate to one another as equals. They are spiritually related as are siblings of the same family. They share traits but in the end differ enough one to the other to be readily distinguished. Each goes its way memorably and elegantly and then makes way for the next. There is beauty maybe more so than truth, but neither are they pretty lies, flattering baubles of a superficial veneer. Rather, they do run deep in spite of their exuberant charm and poignant melancholy. Sempe's dedication to a vibrant and meditative realization underscores the universality of this music and its continued relevance to the thinking and feeling music lover. The whole program ravishes. Truly, this will if you let it be a faithful companion to your musico-reflective self, always able to weave its spell on your being whenever you put it on and give it your attention. An excellent addition to your collection! Juri Seo is a composer-pianist who resides in my state of the States, New Jersey. Some of her music stands out on the recent release Mostly Piano (Innova 968). As the title suggests, this is...mostly works for piano. But not just any works. For Ms. Seo has her own way, tonal--and the examples "#Three" (for piano and percussion), "Three Mini-Etudes in C" and parts of "Piano Sonata No.1 - 'La Hammerklavier'" show a rhythmic vitality bursting at the seams with dynamic tension and personal form. The sonata has a lyrical-classical aspect that glances backward as it forges ahead into something unique to the composer. The "Etudes for Cimbalom" cover much ground in six movements. Folk dance elements and contrasts, energetic dynamics and contemplative counterthrusts intermingle for some exhilarating fireworks. The final piece, a solo piano and percussion piece entitled "vi" (2010) marked her inaugural return to tonality, in this case triads and seventh chords contrasting bitonal ambiguity with tonal clarity. There is as with the other works a somewhat startling freshness about the music. So that is what I experience from this album, telegraphed in necessarily sketchy ways to fit the here and gone format of the everyday blog pages. There would be a great deal more to say were I to concentrate for the rest of the day on why this music is special. For the spinning world we are in I must simply iterate that Juri Seo is a modern original, and that her music on the current volume veers into breathtaking territory at times, and for all that never seems content to work inside the usual trends that occupy much of the contemporary music world. Mischa Zupko writes with a modernist flourish music that sometimes has a lyrical underpinning, while always to my ears blossoms forth with a personal fluidity in his insightful musical-dialectical discourse. The Zupko anthology Eclipse (Cedille 90000 168) features chamber music for piano (Zupko), violin (Sang Mee Lee), and cello (Wendy Warner). Each work has literal thematic content. "Rising" (for violin and piano) is all about meditations on the ascension of Jesus. "Fallen" (for cello and piano) is based on a Garcia-Lorca poem about the suicide of a young man of promise who has fallen into despair. "From Twilight" (for solo violin) comes out of the experience of observing the evening sky as the curtain of night gradually descends. "Eclipse" (for violin and cello) encapsules the feeling of serenity as an evolving eclipse condition is made into music via the overlapping and mingling of motives for the violin and cello. "Nebula" (for solo cello) pits the cello against silence as we are exposed to parts of a wide overarching arc of musical content. From there we go to "Shades of Grey" for violin and piano, in four movements, realizing in musical terms the marriage preparations of Winston Choi and Minghuan Xu, otherwise known as Duo Diorama, for whom the work was written. "Love Obsession" (for cello, piano and six prerecorded cello tracks) is the dramatic finale. It deals with the relentless pursuit of a love object by a determined subject. Highly rhythmic figures portray the manic chase of passionate absorption, ending in some sort of quietly realized fulfillment. There is no simple description of how this music plays itself out. Every work is a world unto itself. Zupko is musically multilingual in the way he adapts a spectrum of tonal possibilities and spins his own original form and content for each. The trio of musicians each brings an enormous absorption and focus to the music, making it sing, bringing its reflective and reflexive brilliance to bear on our experiencing ears. 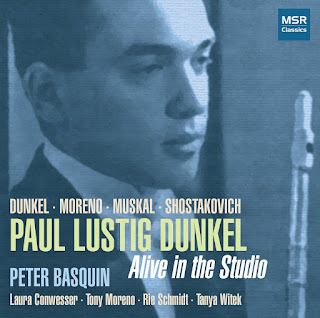 Zupko has a musical mind both open and exceptionally inventive, certainly as exemplified by the works on this album. He is like a fine wine. He is best savored, allowed to breathe. You need to open yourself up, to permit his many faceted music to resonate against your listening sensibilities in a state of centered concentration, Like a complex wine at a peak of maturation, the long finish you experience is just as you might have hoped, in the end satisfying and total in its effect. I have no hesitations in recommending this music to you. Yesterday, I spoke a little about how the romantic piano practice of rubato cascading became more harmonically daring in the hands of Scriabin and ended up further extended by a composer like Roslavets, but that by last mid-century modernist pianism had all but jettisoned the stylistic parameters which found its most eloquent practitioner in Liszt. What such a scenario ignores is the figure of Rachmaninov. (Early Prokofiev aside, who was already very much more the modernist.) Like at least on the surface we think of Bach and his attention to fugal form even if in his later years it was no longer au courant. So Rachmaninov espoused the rolling romantic rubato when many of his compatriots had moved on. I would not want to suggest that Rachmaninov reached the sublime heights of Bach in his anachronistic endeavors. That is no doubt unfair. How many composers would you put alongside Bach in any way? Very few. Rachmaninov (1873-1943) stayed stylistically where he began, for the most part. Of course he excelled in lyric effusions and left us with some beautiful piano music that transcends time in the best ways. For those like me who cannot get enough Rachmaninov piano works, there are today a batch of them that you no doubt have never heard, at least not like this. I speak of the recent CD of Piano Transcriptions (Naxos 8.573468). 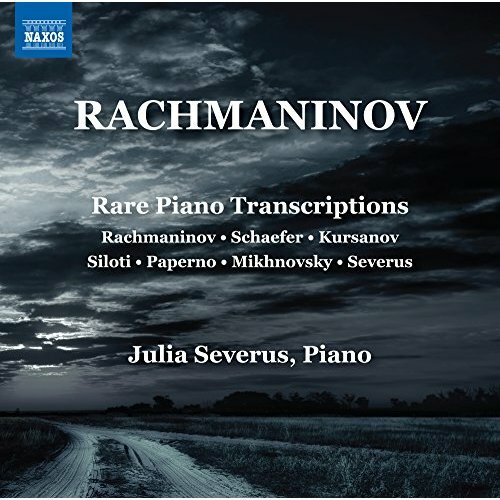 On it is Rachmaninov's transcription of the "Suite in D minor," which was discovered only in 2002, along with a transcription of the Intermezzo from Aleko, plus 21 of his songs, transcribed for solo piano by Rachmaninov and six other composers, including the pianist on this collective program, Julia Severus. She is most definitely in her element with this music. A more sensitively romantic but never overly gushing exponent of this rare music would be hard to find. Many of these pieces, indeed most are in first recordings. The songs in their original form contained involved piano parts, so that the transcriptions carry over the extraordinary pianism and integrate it fully into the solo realm. Perhaps not everything to be heard on the program is an absolute masterpiece, but then some come close. For those for whom the Rachmaninovian path is one you long to linger on, this small fork into more vistas will doubtless delight you. Nicolay Andreyevich Roslavets (1881-1944) is currently at best a footnote in the history of Russian 20th century modernism. Yet Stravinsky at one point called him "the most interesting Russian composer of the 20th century." Now there is a chance to explore his work in depth on the recent 2-CD set Complete Works for Solo Piano (Grand Piano 743-44). Olga Andryushchenko does the duties as the pianist throughout. Her fluid readings seem expressively right for the music. Roslavets was a victim of Soviet disapproval and so never got a lot of exposure or recognition. This complete piano set includes a good deal of undiscovered and reconstructed works that see the light of day here for the first time. Many are first recordings. It is much more involved than one has a right to expect from a long-unknown. There is a kind of pristine coming-into-being to be heard with great profit if you give the music a chance. The music is programmed to follow roughly a chronological order. The first period of his music, say 1914 through 1916, finds the composer in a rather Scriabinesque mode. 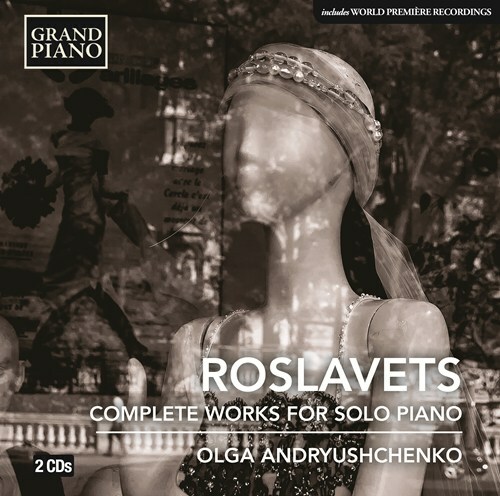 From around 1917 through 1923, the influence remains in terms of a poetic rubato, yet further modernizes in terms of an idiosyncratic tonal ambiguity and the use of what Roslavets called "synthetic chords." To get the maximum out of Roslavets, you need to cast away expectations and let the music itself work its way into your listening mind. It is something a Scriabin enthusiast (such as myself) will see as a further step into a modernism that mostly dead-ended but in the hands of Roslavets convinces and holds its own even though the vibrant currents of modernism by mid-century had largely jettisoned the cascading rubatos that Roslavets embodies in his very own way. Why the Soviet Union party censors should see this music as objectionable need not detain us much. Clearly they found any kind of formalism, or any kind of autonomous musical striving counter-revolutionary. All must be an arm of propaganda. Sometimes composers were able to satisfy the dictates of social realism or circumvent them and still make great music and keep on. Roslavets could not find a way and more's the pity. At least with this two-CD set we are treated to some exceptional music that deserves our respect and admiration. I find the music much to my liking. It has a brilliance of its own and that mysterious cosmic quality that Scriabin pioneered. But it stands or falls as Roslavets. It stands. Recommended for Russophile modernists and anyone interested in the trajectory of modern solo piano, surely. Some composers and compositions have formed such a seminal part of my life experience that they have become important residents of my "permanent" musical mind. The piano music of Ravel (Orchid Classics 100061) qualifies in very absolute ways. When particular works enter into my imaginary shrine of eternal verities, they usually do so in terms of my memory of specific performances that I either first heard at a younger age or versions that I have since come across that somehow have redefined my vision of what the music is about. For Ravel's solo opus I fell upon Samson Francois's 3-LP set on Seraphim many years ago and it has ended up as a benchmark standard for comparison. The versions are not in any way flashy but carve out each musical statement with a care and a fidelity that seem close to what the composer himself heard. I have not had time to audition any of the other complete opus recordings, though I've experienced enough Gieseking Ravel that I imagine his set would be ravishing. A real ear-opener was the old Everest Archive of Piano release of Ravel playing his own music on the touch sensitive player piano that was state-of-the-art in his day. The piano roll transcription of "La vallee des cloches" from Miroirs was one of those revelations you can get when you hear the composer's own version of something for the first time. It is the opposite of a virtuoso approach, slow, brooding, atmospheric, lingering over every note so that the "Valley of Bells" as just that came through like never before for me. With all of the above as a prologue. . . I was interested to receive pianist Stewart Goodyear's Ravel, a single CD compendium of some of Ravel's most beautiful pieces. 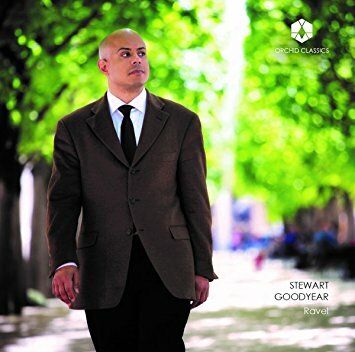 Goodyear has fabulous technique which he puts to brilliant use on movements that can be taken much faster than the norm, so that a shimmer of pulsatingly ecstatic passagework transforms the music to something excitingly other at times. Yet when appropriate Goodyear can dig into the pastoral and/or reflective sort of lyricism that "Le vallee des cloches" or "Pavane pour un infante defunte" demands. We are treated to the sort of dual polar readings he excels in--with the music of "Jeux d'eau," "Sonatine," "Miroirs," "Gaspard de la nuit," and the "Pavane." In the end Goodyear brings an exceptional beauty and sparkling dazzle to these works that is nothing short of extraordinary. I still cling to the Francois and Ravel LPs as a sort of bedrock given for these works, yet I find Goodyear opens other vistas for me, other ways to hear much of this music. Anyone who already loves these pieces as I do will find in the Goodyear spirit a new take on it all. It is tour de force pianism, sometimes incredibly exciting. Recommended with no reservations whatsoever! I suppose it had to happen eventually. That is, an opera based on the life of Van Gogh. 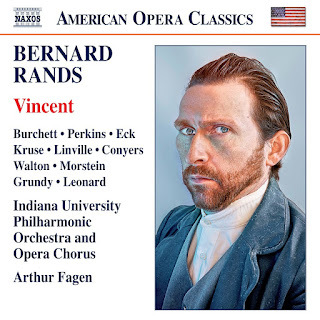 It took until 2011, when composer Bernard Rands completed the two-act Vincent (Naxos 8.669037-38), now available as a two-CD recording by soloists and the Indiana University Philharmonic Orchestra and Opera Chorus under Arthur Fagen. It is a sometimes lyrical, sometimes agitated or otherwise dramatic recounting of Van Gogh's life in essence, from his disastrous experience as a salesman in an art gallery, his struggles to find his style, his closeness to brother Theo, the Arles triumphs and anguish, the fight with Gauguin and Vincent's breakdown and death. All is handled with taste and appealing musical values, a healthy dash of modernism a la post-Wozzeck and a sure theatrical flair. I will confess that the idea of an opera rehashing the tragic life of the brilliant painter did not on first blush appeal to me. His life story has entered the pop-folk vernacular of the misunderstood artistic genius and in some ways given us a romantic myth that may provide a cautionary tale of how one can never be sure of talent when a great one could possibly be living among us, but otherwise perhaps justifies a kind of collective shrug of the shoulders when it comes to modernism and its supposed inscrutability. Nonetheless I have immersed myself in the work and come out with a positive feeling about it. It is constructed with the sort of event arc conducive to gaining an absorbed audience attention. And in the end J. D. McClatchy's libretto meshes with the well-wrought score to maintain and grow the dynamic tension necessary to experience the life story and its very sad yet triumphant end points. There are brilliant moments that musically match the anguish of the main character. Arthur Fagen, the effective soloists and the amassed Indiana University singers and musicians all give us a convincing and intense reading of the score. This is a good one for you who want to keep abreast of developments in modern opera today. JoAnn Falletta and the Buffalo Philharmonic Orchestra can be counted on to do justice to late-romantic, proto-impressionist scores. And so they do us a real service handling the ins and outs of composer Vitezslav Novak (1870-1949) and his In the Tatra Mountains (Naxos 8.573683). As can be heard in this three-work program, Novak was a Bohemian Nationalist who constructed vast panoramas that perhaps owed something to Dvorak but took the music into the 20th century in his own way. The three works open Novak's musical world with a maturity and a sense of motion and tone color painting that mark him as talented and eloquent. You can hear echoes of Bohemian folk music but indirectly for the most part, as if reflected by distance and wide spaces in woodlands or mountains. Each of the three have character and very worthy orchestrations. They seem descriptive but well beyond a literal program. And so as we immerse ourselves in the title work "In the Tatra Mountains" (1902), and the following pieces, "Lady Godiva - Overture" (1907) and "Eternal Longing" (1905). We linger in expressively evocative worlds, now pastoral, now in a terrain of inner feelings and passions, always with a sense of proportion and contrast. 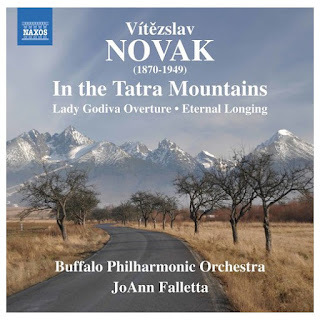 Novak may be pretty well forgotten to most of us, but Falletta and the Buffalo Philharmonic give us very musical reasons to revel in his rediscovery. The three works give us much substance and pleasure. And so there is a good deal to appreciate on this disk. Why? The utter seriousness of the music, its incredible power is given to us undiluted, aesthetically sound yet not overly florid, tempos seeming just right, now lingering and contemplative, now expressing great depth of feeling and strength. The notes themselves are the central focus, with enough interpretive feeling but never too much. The parts are articulated with a clarity of purpose so that we continually hear the equal unfolding of fugal voices, never missing the contrapuntal whole that is so critical for a full understanding of this masterpiece. The fugal Bach surpasses its times to speak across all time. Indeed the "Art" is within that select grouping as perhaps the highest of expressions of Bach's razor-sharp otherworldliness. Words cannot begin to do justice to the music. All I can do is point you towards this version. Your ears will do the rest. Let your mind boggle! 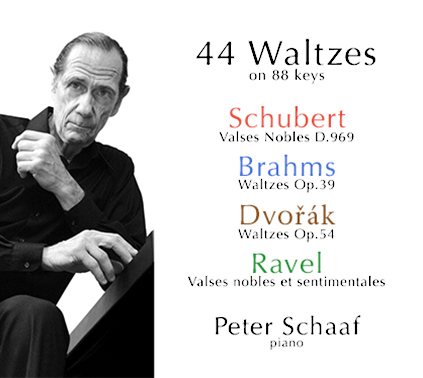 When you do not know what you want to listen to, you may want to hear pianist Peter Schaaf's 44 Waltzes on 88 Keys (Schaaf Records 102). That may sound facetious but I am quite serious. It is what the title suggest, waltzes. Little miniaturist gems both familiar and not, by the likes of Schubert, Brahms, Dvorak and Ravel. Everybody will doubtless know the Ravel, much fewer the Dvorak, but all have a special something that takes the music well beyond the salon per se (we do not have salons anymore regardless) and into the realm of pure music (which thankfully many of us still need and demand). An important key to it all is Peter Schaaf. Most of the waltzes have a periodicity and symmetry that have generally been expected of the form over the years. Excepting Ravel's "Valses nobles et sentimentales" they have brilliance but also a dominant regularity of waltz form. 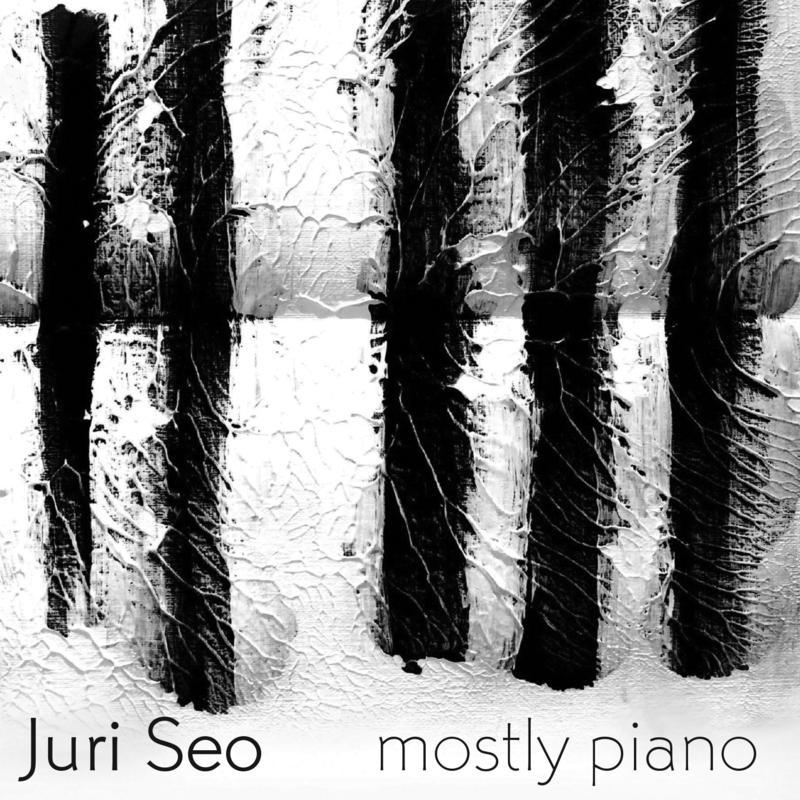 They give a world-class pianist an interpretive set of possibilities that includes rubato, dynamic variations, subtle articulations, varied attacks and whatever else seems fitting to the artist in his or her vision of what a performance might sound like. Of course a supremely endowed pianist may make a love-fest of pretentious over performativity out of works like this, if "taste" is not sufficiently present. Peter Schaaf has the ability to keep the musical content foremost while engaging in convincing interpretive readings. The Ravel, most inviting to the interpretive arts, has a subtle beauty in Schaaf's hands. Like the more straightforward waltz pieces in this delightful program, the readings wear well and bring to the forefront the brilliance of the composers involved. Schaaf makes of it all a great pianistic outing. I do not fail to respond to this program, no matter what mood I may be in, and I have been in definite moods lately so I am confident in my reactions. 44 Waltzes is a kind of triumph of musicality. I heartily recommend it! Schaaf makes the experience a true pleasure. Messiaen's "Quartet for the End of Time" is without question one of the masterpieces of modern chamber music. Once you hear it a few times, it takes its place inside your musical mind and stays there. It expresses in sorrow and transcendence the horror of Nazi Europe and its evil promise. No wonder, Messiaen wrote it as an inmate in a concentration-work camp, for performance by himself and fellow musicians to play as an act of musical defiance in the face of despair. Never has such bitter sorrow led to such music! 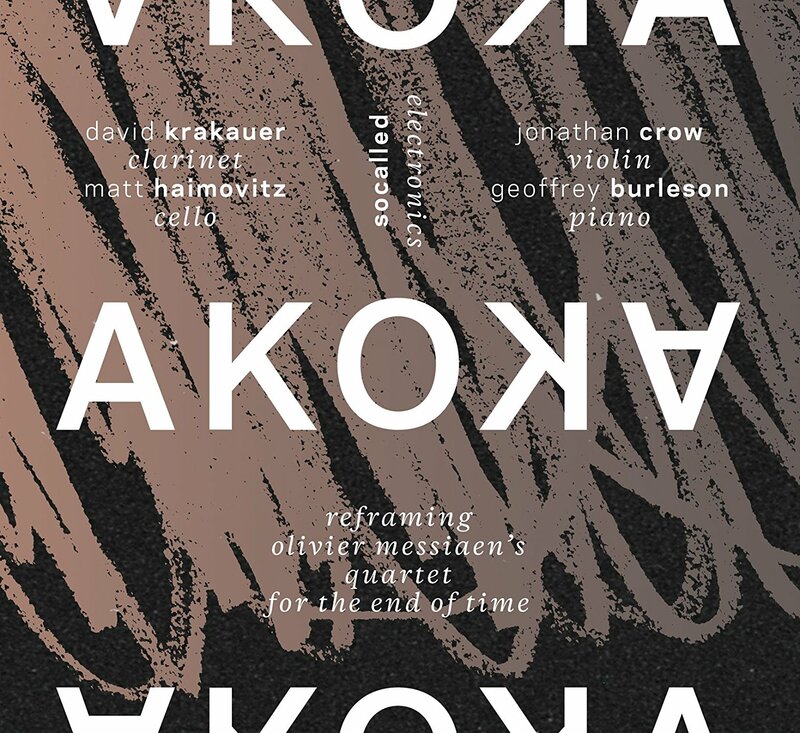 Akoka: Reframing Olivier Messiaen's Quartet for the End of Time (Pentatone Oxingale 5186 560) is as it says, a new recording of the Quartet as the centerpiece of an extended performance which sandwiches the work in between David Krakauer's "Akoka" and socalled's "Meanwhile". 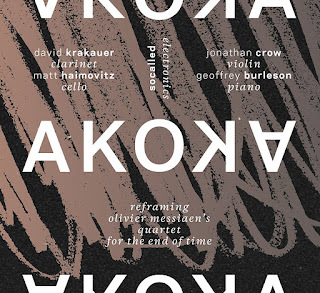 The latter is an ultra-contemporary coda to the work, a sort of remix of the Quartet; "Akoka" is dedicated to the original clarinetist in the first performance, one Henri Akoka. It is a structured improvisation based on Krakauer's template. The bookend performances give us a current-day framing and affirm that Messiaen's music of protest remains completely relevant to our times, as we feel the shadow of evil making itself felt again all over the world. This performance of the Quartet is up there with the best. David Krakauer, clarinet, Matt Haimovitz, cello, Jonathan Crew, violin, and Geoffrey Burleson, piano, give us a very thoughtful and spirited reading. The bookend pieces serve to situate and extend the impact of the music and do so in interesting ways. All in all this may well be the version you should get if you have none to date. It is essential music, as fresh as ever, as movingly personal as it is universal. Extraordinary flute master Paul Lustig Dunkel appears before us at the peak of his powers on the recital recording Alive in the Studio (MSR Classics 1554). On it Peter Basquin provides sensitive and appropriate accompaniment as needed. Laura Conwesser, Rie Schmidt and Tanya Witek flesh out the flute quartet on Dunkel's "Quatre Visions Pour Quatre Flutistes." Tony Moreno gives us the percussion-drum part on his "Episodes for Flute and Percussion." Those are the bare-bones basics. It is the flute of Dunkel and its fine tonal presence and virtuosity that carries the day in the end. He is a well healed flautistic spectre on Dunkel's arrangement of Shostakovich's "Sonata for Cello and Piano in D Minor Op. 40." The work sounds completely natural and poignant in the flute substitution of the cello part. Dunkel's own "Quatre Visions Pour Quatre Flutistes" (2014) has a dynamic and very idiomatic fullness and inventiveness about it. The four-fold flute family sonority is a joy to hear. The rest is worthy as well. It all ends up as a model of what a world-class flautist can do. Bravo! 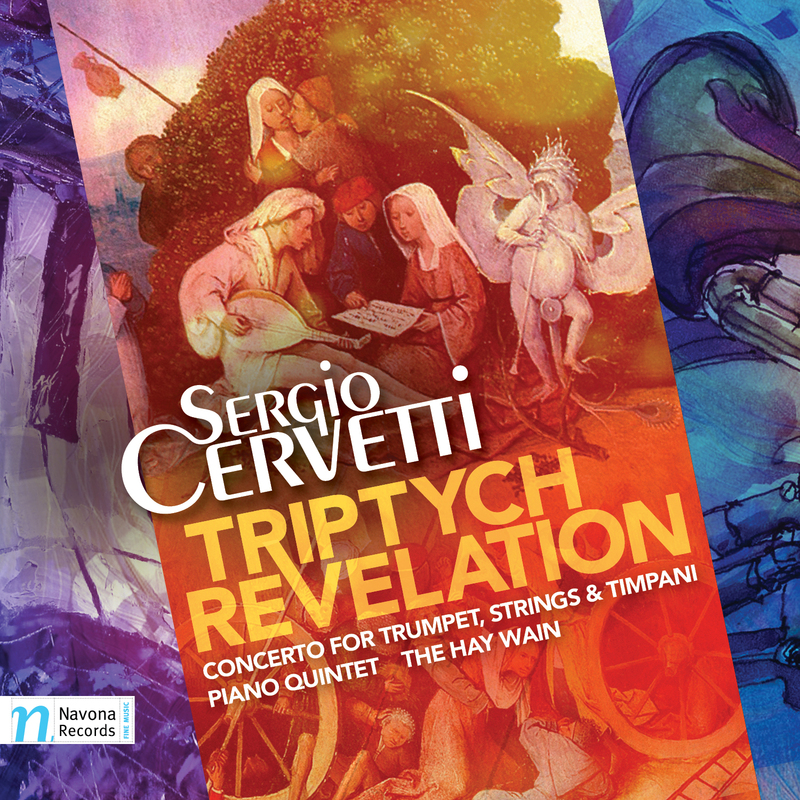 Sergio Cervetti's music is in the process of being well documented by Navona Records. (I've covered a number of them. Type his name in the search box above for those reviews.) The latest release, Triptych Revelation (Navona 6099), is an especially good one. It covers three most interesting and provocative modern works from three different periods of his career, the "Concerto for Trumpet, Strings, and Timpani" (1973), the "Piano Quintet - Toward the Abyss" (2015) and "The Hay Wain" for virtual orchestra (1987). Each of the three shows a pronounced quality of its own. Taken together there is a kind of revelation about his music. "The Hay Wain" is a response to Hieronymus Bosch's painting, with synths and such forming a thick wash filled with narrative mystery. It has all the complexities of Cervetti's acoustic orchestral music and a convincing orchestration of the battery of sound module tracks as well. The Piano Quintet is a musical realization of Le Voyage from Baudelaire's Les Fleurs du Mal. It is an intricate modernist work worthy of Cervetti at his very best. The "Concerto for Trumpet, Strings and Timpani" makes classic use of the instrumentation and its ceremonial fanfarish possibilities, perhaps reminding slightly of Lully but of course all Cervetti. And so there we have it. This is music of our current modern age, not afraid of tonality but not trying to resurrect a movement backwards, either. And the expansive possibilities of high modernism are never wholly absent (hear the Quintet!). It is an excellent listen. 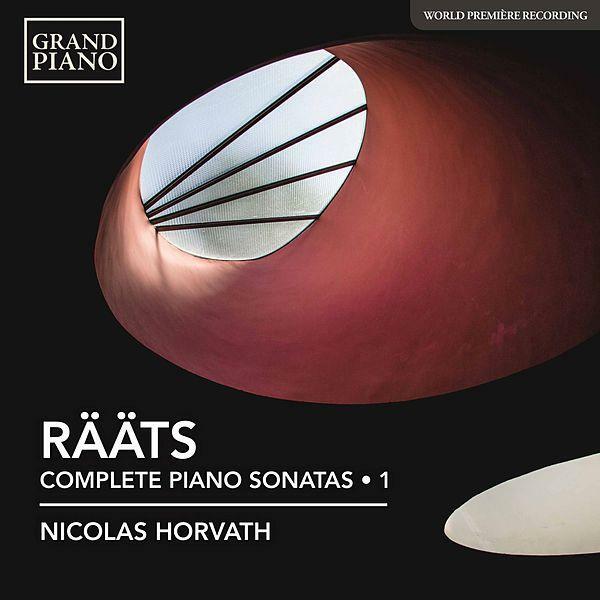 This first volume gives us sonatas 1-4 and 9-10; the first three hail from 1959, No. 4 from 1969, No. 9 from 1985, rev. 2014 and No. 10 from 2000, rev. 2014. His is a very motile, dynamic modernism that takes maximum advantage of the percussive nature of the instrument. The music is not quite like anything else. The long span between the first and tenth sonatas does not at first listen show a huge stylistic change, there is a pronounced Raats-like quality to all of them. But that pronounced originality is the constant thread that makes the entire program stand out as special. Jaan Raats has found a way to be modern without being what one might expect. That is something to appreciate. Explore this music and find another musical world awaiting! The avant garde new music world in the '60s and beyond in the USA? The world has not caught up yet, except of course for those intrepid listeners who have made a point of immersing themselves in its explorations and exceptionality. One can draw connecting lines between the American and European scenes of course, and what has taken place in Japan. In the end though there have been as many differences as convergences. The all pervasive influence of John Cage has been decisive here. His liberation of noise and silence, the use of chance and indeterminacy, and the overall nonconformist and Zen obstinacy has left a mark on those who came in his wake. Alvin Lucier (b. 1931) has been one of the more controversial and innovative of the post-Cagean 20th century group. 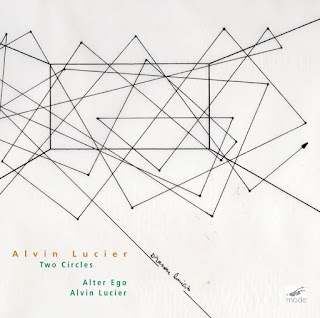 Two Circles is a recent anthology of Lucier chamber works for instruments, electroacoustics and voice. The chamber ensemble Alter Ego brings to the music great care and understanding. The works cover a broad swath of time from 1968 through 2012. The earlier work, I Am Sitting in a Room (1968) has the uncanny meta-part for Lucier's voice, remade now so that his voice shows a golden ripening. It is a simple statement of what the project is meant to do, and then its repetition, each time played back into the room so that Lucier's voice becomes an acoustic transformation that gradually takes on the room's acoustic resonance and in the end becomes that room. 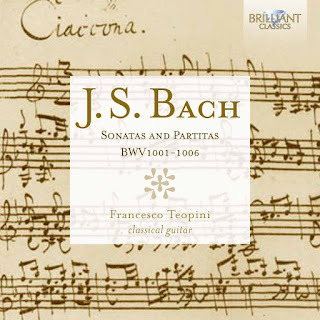 His instrumental works represented in this album have to do with tunings and microscopically contrasting alternate tunings that beat against one another, and the making present of the acoustic properties of the space in which the music sounds. There is more to it than that of course. And there is a science-like rigor to it that in the end brings enlightenment to the hearer. There are a times an almost clinical quality that may at first be off-putting. But ultimately the music stands or falls as music. Lucier's music can be difficult and challenging. These works are most certainly that. Yet careful, repeated listens take you on a journey through a microscopic universe that has all the qualities of aesthetic experience but brings us there in ways more radically contemplative than we may be used to. 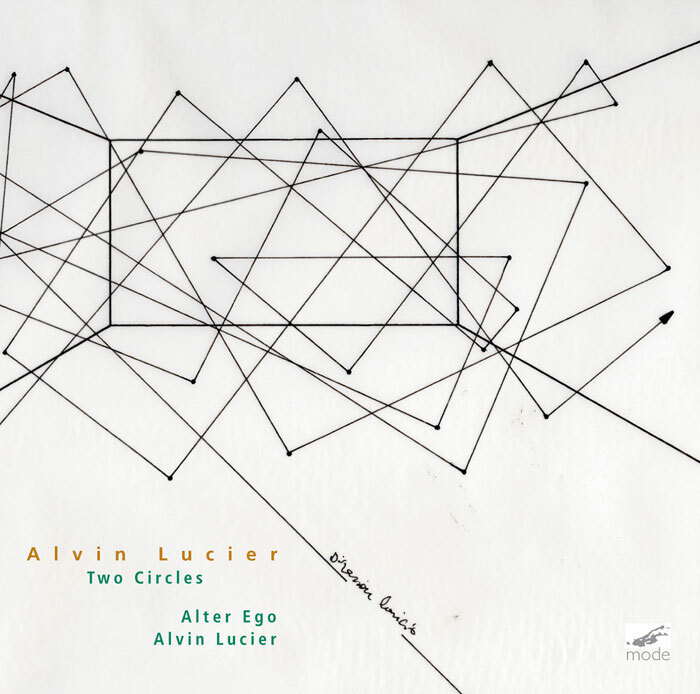 Two Circles serves as a worthy introduction to Lucier. It adds to our appreciation of his music if we already are familiar. This is certainly not in the realm of entertainment. For those willing to take the music as seriously as Lucier intends it to be it is revelatory. How many excellent composers active today do you not know? Of course the answer for all of us is that we cannot know how many unknowns there are unless we already know them. One I am glad to know is Piotr Szewczyk. 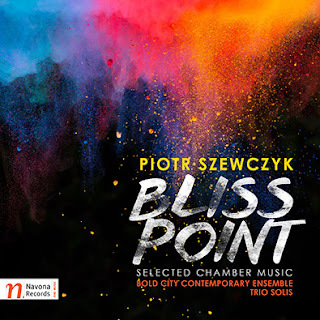 His album of Selected Chamber Works, Bliss Point (Navona 6093), brings to our ears some nine provocative examples of his art. The violinist and composer is Polish-born, which explains the hard-to-spell name. The music does not sound so much Polish as modern-international in scope. There is a great rhythmic vitality and kinetic energy in this music.The modernistic thematic-harmonic bedrock of the music is in no sense vitiated by its rhythmic core. The whole gestalt of the music enchants and speaks with a specially singular voice that makes it all stand out. Nine works in all, each with an instrumentation that seems wholly appropriate to the piece at hand. The combinations and permutations are considerable--oboe, violin, cello and piano; violin and viola; piano trio; string quartet; flute, clarinet, cello and piano; string trio; violin and piano; two violins; and violin, clarinet, cello and piano. Each has considerable individuality. Each is performed with zest and sympathetic understanding. This one is memorable! Viva Piotr Szewczyk. 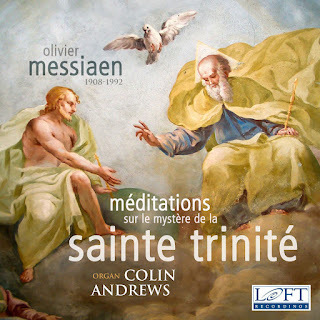 Messiaen's Meditations sur le mystere de la sainte trinite (Loft 1150) is one of the monumental organ works of our day. Messiaen completed it in 1969. It started in 1967 as four improvisations in celebration of the rebuilding of the organ at Sainte Trinite as well as the 100th anniversary of the cathedral's existence. The work grew and blossomed until it reached its final form. Birdcalls, plainchant, and Greek and Indian rhythmic patterns all are incorporated into the work, as was the case in varying degrees in his later period. Of all of Messiaen's organ opuses of the later days this one is as complex and monumentally titanic as any. Organist Colin Andrews comes through with a reading that underscores the complexities but also draws coherently the outline shape of the ongoing structural essences. That is only to say that in his hands there is great sympathy and understanding for the work and its fullness. The Meditations are essential listening--both as some of the most advanced modern organ music ever written and as a milestone of the composer's later evolution. This version rivals any others I have heard. Get it without hesitation. 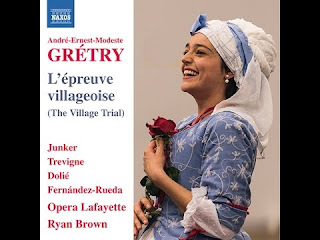 If the French school of baroque-classical music has put you under a spell, you will be happy with Andre-Ernest-Modeste Gretry (1741-1813) and his most popular work, the comic opera L'epreuve villageoise (The Village Trial) (Naxos 8.660377). The 1784 opera gets, surprisingly, its World Premiere Recording with this release, under the very capable and enthusiastic auspices of Opera Lafayette and soloists under Ryan Brown. In truth this is a great example of how the best of the French school can be lighter than air, extraordinarily tuneful yet in no way insubstantial. A listen or two illuminates exactly how the opera delighted audiences the world over in the century between 1784-1884. It still has the power to charm, as Opera Lafayette show so convincingly. Here is an opera that has the catchy accessibility of Rossini, yet a French lyrical dynamic at its core. It is a beauty. And it has the Naxos price and quality. Take the jump if you want to explore a forgotten gem. The venerable art of Japanese Shakuhachi flute goes back some ways, to a sect of Zen monks in the 17th and 18th centuries. Today we contemplate a Western player of great finesse performing a program of contemporary, mostly American compositions on The Universal Flute (Innova 942). We are treated to five compositions, each combining deftly the traditional Shakuhachi tonality and technique with some new music twists. 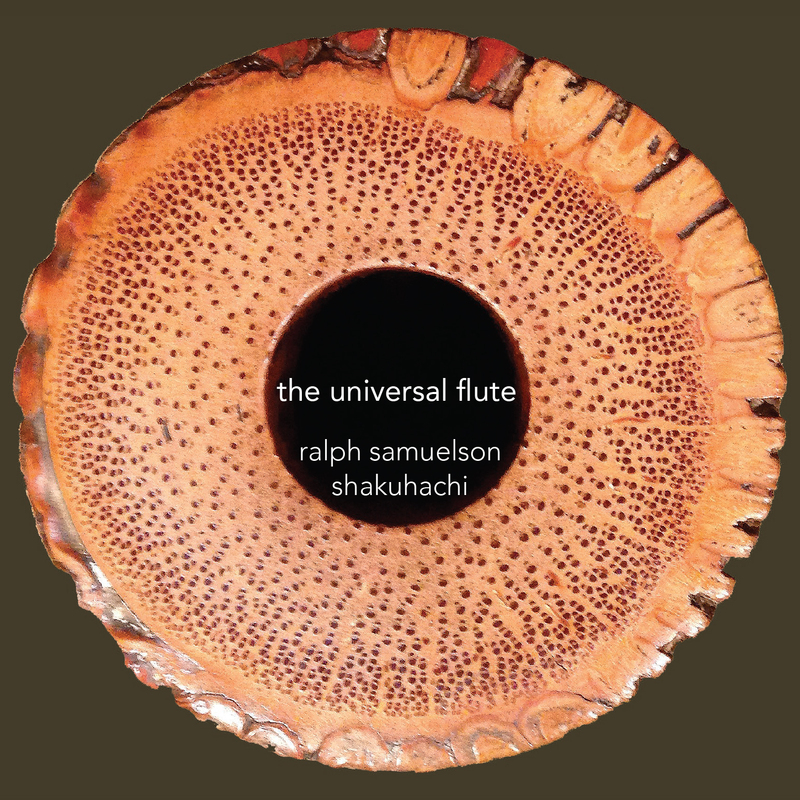 Ralph is either unaccompanied or joined by idiomatic ensemble elements: koto, kugo harp, vocals, shamisen, and bansuri. As in the traditional art there is the use of space and special attention to each note to get a cosmic sort of suchness that is part of the aura surrounding the shakuhachi. This explains the album's subtitle "Discovery in a Single Tone." We experience two versions of Henry Cowell's "The Universal Flute," one for unaccompanied flute and the other with bansuri accompaniment. Then follow Teizo Matsumara's "Shikyoku Ichiban" with shakuhachi and koto, Richard Teitelbaum's "Hi Kaeshi Hachi Mi Fu," Bun-Ching Lam's "Three Songs of Shide" with kugo harp, and Elizabeth Brown's "Afterimage" with shamisen and vocals. This is music of depth, something that will appeal to all who know the shakuhachi tradition as well as those seeking ambient meditative moods. 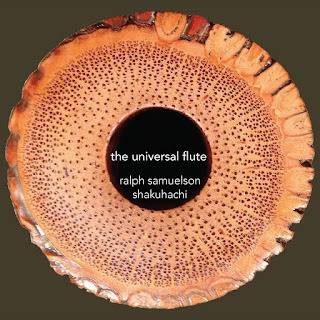 Samuelson is a true artist of the instrument and the music has much about it to explore and discover. 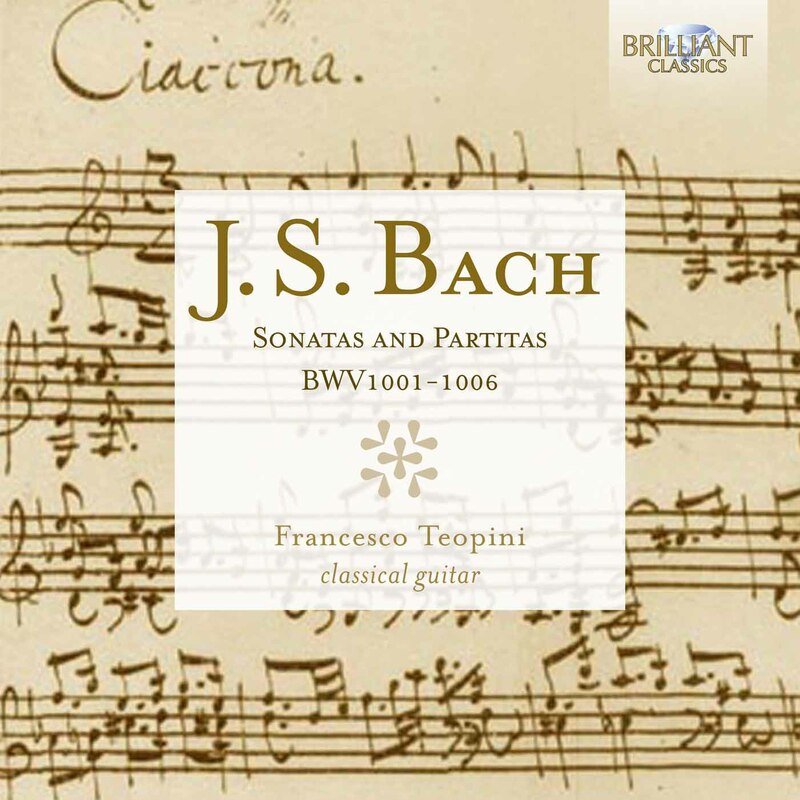 The smaller ensemble world of Johann Sebastian Bach seems to me as I grow older ever more timeless, whether it be the unaccompanied cello pieces, the keyboard works or the Sonatas and Partitas for Solo Violin, The latter we consider today in their version for solo guitar (Brilliant Classics 2CD 95424). Francesco Teopini does the honors on the nylon stringed classical instrument. The results are alternately introspective and lively, and always rather brightly insightful. Teopini gives us warm, feelingful readings, nicely idiomatic interpretations that have a glow of sincerity, ringingly clear and expressive. The three Sonatas and partitas come to us with loving care and an immanent presence on the guitar. It is as if we are hearing these pieces anew, yet the deja vu recognition points come at us regularly, like the gradual dawning that the person who is speaking to us is our long-lost life twin. Brilliant! And especially attractive at the Brilliant budget price.